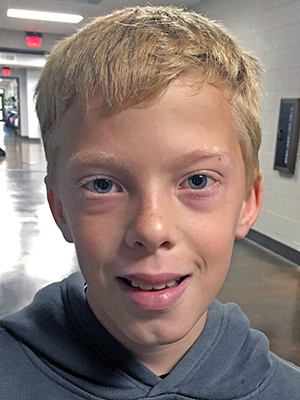 Blog :: The first 2018-2019 Star of the Month winner is Luke M. :: Read Naturally, Inc.
Luke has faithfully come for Read Naturally two mornings per week BEFORE schools starts for 3 years. He began in second grade on level 1.0, and today he reached level 4.5. Specifically, that is 7 levels, 168 stories, and 5,040 minutes of hard work! He began reading 24 wcpm and is now reading 94 wcpm. His progress doesn't stop there. His expression while reading has greatly improved, as has his quiz accuracy, even with the increase in difficulty of text. His retells are well organized, focusing on the important details. Luke's initiation of his retells always began with "This story was about....", but now he can beautifully begin with his own introduction. This is a testament to not only the effectiveness of Read Naturally in all areas of reading, but also Luke's dedication and perseverance. He is a model student who sets the tone with a good attitude and without complaining. The Read Naturally Star of the Month program is designed to celebrate students who work hard to improve their reading skills using Read Naturally's intervention programs. Each month, we select one student to feature in our newsletter. The selected student wins a $50 Barnes & Noble gift card, and the school or teacher who nominated the student receives a $200 gift certificate for Read Naturally materials.